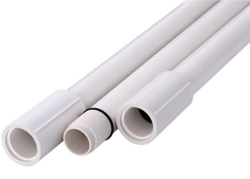 We are a leading Manufacturer of pvc column pipe from Rajkot, India. Easy Installation of Column Pipe for pump in Tube / Borewells. Assured MS, GI, HDPE & Steel pipes. Suitable in the submersible and the jet pump for irrigation, sifted pumping system, domestic, industrial mining, chemical distribution or can be used for many other purposes. Looking for UPVC Column Pipe ?